What is it about the Celtic culture and the symbolic meanings of their icons that, centuries later, still has us so enraptured? But the sheer volume of Highland Games, SCA events, movies, music, etc. that today’s culture craves certainly speaks to the spellbinding power of the Celtic mystique. Additionally, Celtic symbols top the list of “most requested tattoo art” and that’s gotta say something, right? While we have no scientific data explaining the why’s of this phenomenon, we do know the world still cries at the end of the Braveheart and kids in the 2,000’s know what the “Quickening” is. We, also, know our Pagan predecessors were deeply spiritual, connected to the Earth and loved Mead and Ale as much as we do. For us, these are good enough reasons to love them still and so it naturally followed we would include an ever expanding list of Celtic symbols and their meanings. Celtic mythology speaks of the Goddess Brigit (also known as Brigid) who is daughter to the Dagda. She is regarded as a triple goddess and protectress, giving generously to all living things. The story goes that upon the death of her father Brigit wove a cross. The Christian version she told the story of the cross to the dying man who was baptized just moments before he died. In earlier Pagan history the cross represented the four main celebrations of the year and the hub of time. Brigit’s cross in particular ties to Spring when baby animals begin being born. Brigit’s popularity was so strong that she was nicknamed Mary of the Gels. Historians see her as being very similar to Minerva and Athena. She remains the Goddess presiding over poetry, husbandry, metal smithing and healing arts. In ritual she may be represented not simply by her cross but also candles, bells and farm animals. Brigit’s cross appears throughout Celtic regions on sacred wells, trees and various pieces of art where they remain to protect the land, nature and people. 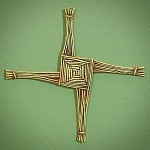 On February 1, her feast day, its customary to make Brigit crosses out of rushes, which should never be cut. Rather they’re gently pulled, woven and hung from the doors of a home to turn away evil. 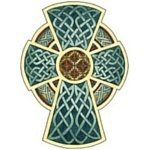 There are a lot of opinions about what the Celtic Cross represents depending on the region, superstitions and artistic representations. In Ireland it’s commonly associated with the eternal nature of God and the halo of saints and angels. In other settings people may tell you that the Druids created these as phallic emblems added to the cross to neatly disguise their true meaning to those unfriendly toward pagans. Modern interpretations spurred by the New Age movement say that it is a solar symbol that later adopted by Christians with a different story suited to the faith. Or they may infer that it symbolizes the four main elements or four cardinal directions. Historians have a hard time proving exact origins simply because it’s an ancient symbol that appeared in more than one culture and belief system. One story goes that St. Patrick stood in a Lunar Goddess’ circle as he spoke. He drew a Latin cross in the circle and the Celtic Cross was born. Such co-opting wasn’t unusual as it aided conversations. 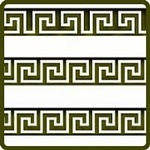 A Chevron is an ancient symbol, appearing as a v-shape. 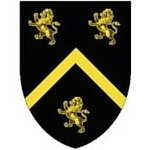 It that appears in a wide variety of settings including heraldry, flag designs, pottery and architecture. Among the Celts the shape acted as the mark of a warrior or hunter, or someone in the community who was a builder. Generally the Chevron symbol represents dutiful service given freely. 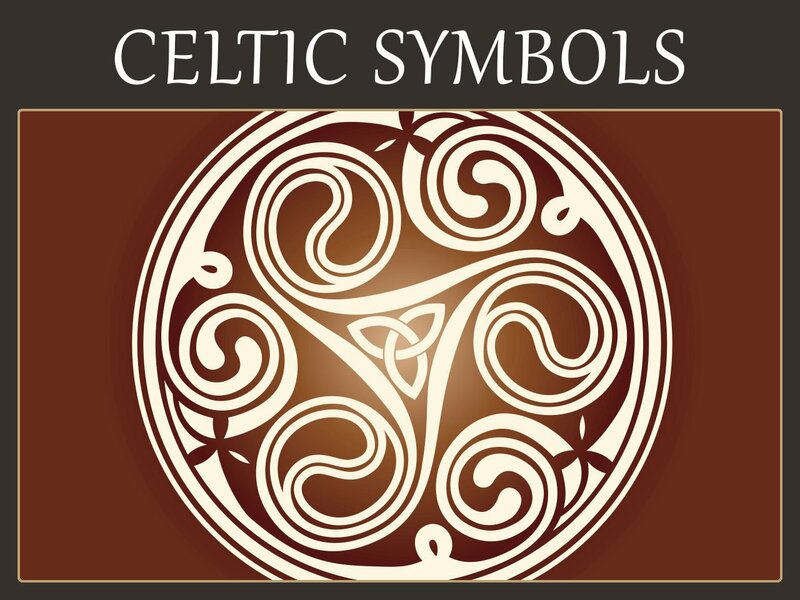 This Celtic symbol can also represent the peaks and valleys in our lives and it also serves as a symbol of protection as it’s peak and “sloped arms” reminiscent of a roof. 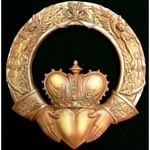 Briefly, the Claddagh ring has two hands holding a heart crowned on top. The story goes that the very first ring of this nature was made for two people who were separated by an ocean as a representation of unity, love, companionship and faithfulness. Ever the Scorpio, when I really started looking at this ring’s symbolic meaning I discovered a history so rich, so deep that I devoted an entire page to the Claddagh Ring meaning, history & how to wear it. 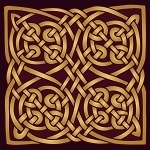 Knotwork is a predominant pattern throughout Celtic art. The major element is the unbroken lines that make up any piece. The eternity knot has a closed path. There is no beginning or end so it represents changeless, everlasting cycles – that of time, of enlightenment and of course love and friendship. Where the knot crosses the symbolism becomes a unity of kindness and wisdom. 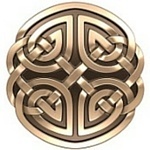 This Celtic symbol also bears the additional meaning of the duality of male-female, yin-yang and faith vs. worldly things. 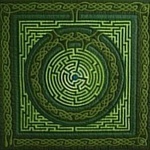 The Celtic Maze has many pathways and dates back to pre-history. By comparison, a classic labyrinth has one path that winds around to a center point then back outward. As a meditative or prayer tool its said that one should release burdens on the way to the center of the pattern (symbolic of the Monad) then accept on the way out what you most need. Some of these patterns appeared on ancient churches for specifically that purpose. Both emblems have ties to the patterns of our lives, including the obstacles faced no matter our Path. The Quaternary knot has four sides and is a little less known than the traditional Celtic Knot. Most experts tell us that the four sides have specific meaning. Some say they signify the four major Celtic festivals of Imbolc, Lughnasadh, Beltane and Samhain. Others feel the sides correlate to the directions, elements or even the four main Gospels. There’s also the chance that the Quaternary knot symbolizes the treasures of the Tuatha – the Sword, Cauldron, Stone and Spear. 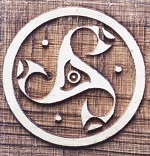 As the name implies a Celtic Shield Knot was used for warding (keeping away). While most people associate this particular design with the Celts its actually far older. The horizontal and vertical arms combine to depict the connection between the temporal and eternal, all surrounded by a circle that keeps things joined in harmony. In Celtic symbols and their meanings, the Spiral represents our spiritual nature and the potential for our soul’s on-going growth. Like the universe itself our soul is ever changing and expanding. Clockwise Spiral: Represents the element of water. It may also embody personal power. 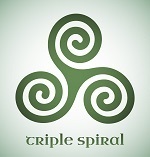 Triple Spiral: Is associated with the Goddess as well as the natural cycle of life, death and rebirth. Simple depictions also connect to the sky, sea and land and how they influence human life. Steps are very common Celtic symbols and are dominant patterns in Celtic art starting around 450 AD. Eventually they made their way into Christian art as well. There is little written on the subject of their value. What we do know is that geometric designs fill Celtic works, and this may have been yet one more pattern that acted like a placeholder when other images didn’t suit the artist. The Triquetra or Trinity Knot has three parts that interconnect. As the knot itself, it symbolizes anything in the world that’s bundled in threes such as the mind, body and spirit. The Triquetra symbol appears on rocks throughout the Celtic region and also in the Book of Kells, a well-known illustrated tome that reflects the intricacy of Celtic artwork. Pagan custom associates the Triquetra with Odin, the three-fold goddess and three elements of nature – water, earth and air. In Christian tradition it becomes a representation of the Triune God (Father, son and Holy Spirit). The Triskele or Triskelion is a form of Triple Spiral that likely originated before the Celts established villages. It’s most oft seen symbol in stone art from early Celtic history, then later appears in Christian manuscripts. 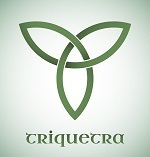 As with the Triquetra the symbolic meaning is that of a Triune Deity. The Triskele bears the secondary name of life’s spiral and its certainly not limited to only Celtic symbols. It has, in fact, been discovered in Hopi tradition and ancient Greece. Drawn in a continuous line it represents life’s movement and other three-part elements of life (like the past, present and future). Because the Triskele’s symbolism is that of having the will to move forward no matter the circumstances, it is one of the major Celtic symbols for strength. Who were the Celts anyway? The Celtic people spanned numerous countries including Italy, Greece, Ireland, Scotland and Wales. A people of Oral Tradition and art, they left behind numerous examples of their unique ways of depicting the world and their beliefs. Roman literature speaks of the Celts as colorful, which is certainly reflected in their creations including well-crafted pieces of metal work. 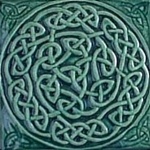 Celtic art and markings burst with symbols many, of which invoke the energies of Nature and the Universe itself. We believe that such efforts including charms and amulets evolved from mystical traditions strongly focused on Mother Earth and her mysteries. By creating various pieces of art – be it a carving or a piece of jewelry, they intended to capture the power of the emblem and activate it to improve daily life.